Well, now, this is certainly embarrassing. I'm not sure how it happened and wonder if it was caused by some unseen force (garden fairies) at work in my garden, playing tricks on me. The other possible explanation is that I did this in some sort of subconscious gardening-in-a-hurry state of mind as I quickly planted bulbs last fall. As a long time vegetable gardener, my natural, self-taught method of planting falls along these lines. I call it Straight-line Obsessive Planting or SLOP. 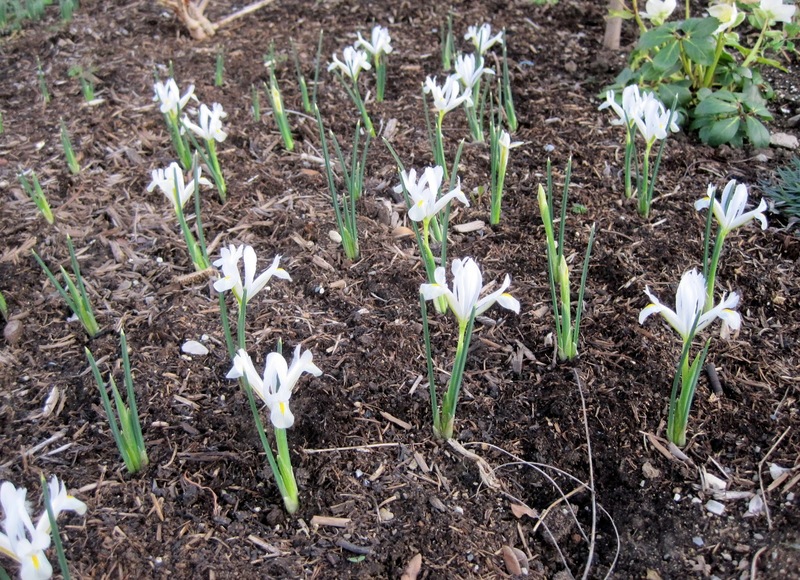 Apparently, being aware of a tendency toward SLOP doesn't prevent a gardener from planting bulbs in straight rows. Here is the embarrassing evidence. 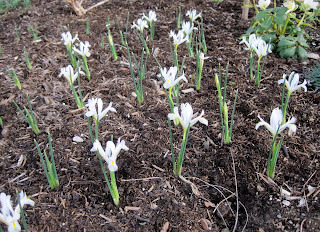 Lovely irises, in this case Iris reticulata 'Natascha', have some how ended up in a row formation. I would have bet money that I dug one big hole last fall, which I did, and scattered these bulbs in the hole in some kind of a non-linear, random fashion. Apparently, " non-linear, random fashion" means slightly crooked rows. 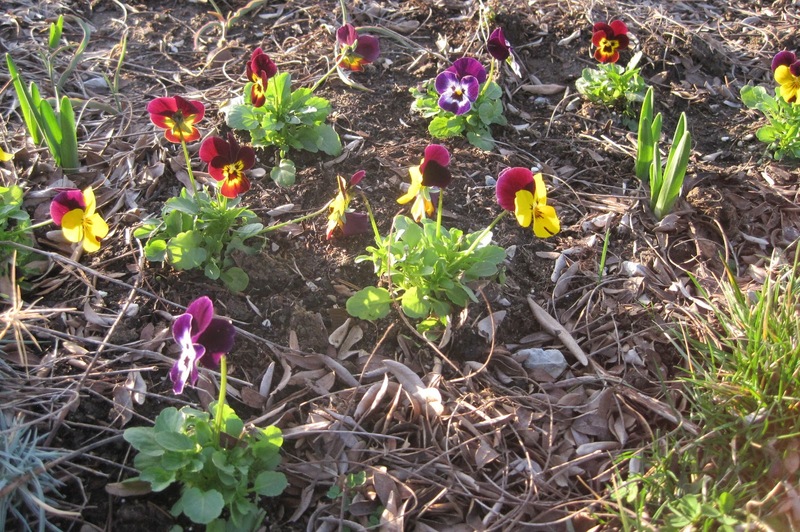 Too late now, violas and irises all in a row. I planted three flats of violas out and about in the garden here and there and everywhere in preparation for Easter festivities in my garden on April 8th. I hope the violas aren't truly "all in a row". If they are all in a row, maybe I should dig them up and try again. I may need Dr. Hortfreud to guide me the next time I plant something other than vegetables. These natural tendencies are apparently often difficult to overcome on one's own. When I read your posts, my husband looks at me like I've gone to the loony bin. Thanks for another great laugh! Maybe you could think of something to add in and blur the lines? HAHA! I am a SLOP planter too mostly by accident. By the time I realize it I just can't pull everything up and move it. I agree with Leslie, I just put extra stuff in between it to make it not look so even-steven. Oh i should remember that acronym, SLOP, most of us are SLOPs! 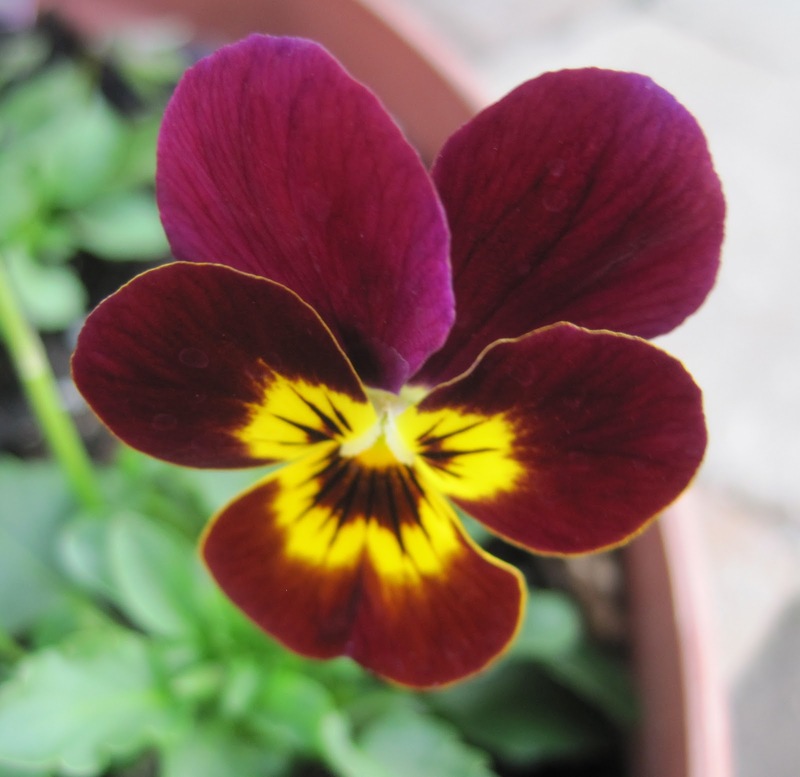 Whatever, i love the color of that viola. 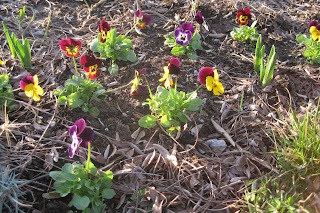 Violas and pansies always make me smile, especially with the sun shining on them. My first comment disappeared. Hope you don't get it twice now. Carol - your post had me laughing out loud this morning. Thanks for the little pick me up! Hopefully by April 8 they will have filled in and be so full of blooms that you won't notice those lines. Carol, I think Lisa is onto something~They will fill in nicely. I do the same thing every time. Then when they are up and growing I groan to myself "cluster them Lona". LOL! That is too funny - I do the same thing all the time, even though I HATE how it looks when things are planted in geometric patterns! Natural is so hard to achieve. I think you are right - the fairies probably replanted your random order with straight lines, playing a trick on you! Thanks for the chuckle. I'm sure it must be the result of overactive squirrels during this mild winter! I think they look quite pretty. I myself am unable to do straight lines, but I do attempt to when I plant my veggies. They usually take an angle of some kind. I vote to blame the squirrels. I know *I* didn't plant all those bulbs in my backyard in a bunch of straight lines. I would like a SLOP gardener t-shirt. Surely one of the graphic designers amongst us could get on that?